Growing sunflowers in your school garden is a great way to investigate real-life maths. Find a well-drained garden patch. Dig your garden to a depth of about 50 cm. Use a slow release fertilizer like Ozmocote. Sow the 5 seeds in a clump to a depth of 3 cm and cover with soil. Plant each clump 50 cm apart. Water lightly and keep the soil moist. Seedlings should appear in 5 – 10 days. Remove the weaker 1 – 2 plants in each clump when they are about 10 cm tall. Leave just the best 1 – 2 plants in each clump when they are 30 cm tall. If necessary, remove any extra plants to leave just one plant in each original clump at about 50 cm. 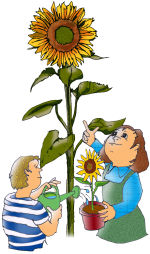 Enjoy looking after your sunflowers and watching them grow. For plenty of ideas on using real-life Sunflower Maths activities with your students, see the Sunflower Maths Sprouts in Sneak Peek. Flags are packed with amazing real-life maths. The patterns and colours, the symbols and, of course, the shapes. The vast majority of flags in the world are rectangular. You can investigate the ratio of the shortest to the longest side. Some are in a 1:2 proportion, like the Australian and British flags, or a 2:3 proportion, like the French, Italian or Spanish flags. Qatar holds the record for the largest flag in area, covering 101 978 square metres. It was created for their National Day in December 2013. It had a mass of 9.8 tonnes too. Afterwards, it was recycled into 200 000 satchels for school children. The longest flag in the world was created in Syria on 10 July 2011. It was 16 km long. And in Bangladesh, 27 117 volunteers holding up red and green blocks created the largest human flag on 16 December 2013. 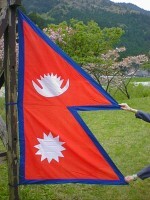 Then of course there is the only non-quadrilateral flag in the world, the Nepalese flag. It’s a pentagon. Imagine what facts your class can collect to astound you, visitors and parents alike. Did you know that budgerigars can turn their heads 180 degrees and fly over 100 km in search of water? Real-life mathematics can be found everywhere. Each group of students in your class could investigate a favourite animal or bird and create 10 top maths facts to tantalise their classmates. Create class Maths Facts books to browse through regularly. Challenge your students to construct 3 extended maths questions based on one maths fact as a daily mental warm-up. e.g. Can all birds turn their heads 180 degrees? If not, which other birds can? Why would this be a useful skill? The idea is to encourage students to think for themselves, to see how to ask a maths question as an active participant, not just a passive listener, or a passive answerer of someone else’s question. Look for examples of real-life maths from the past. Both teachers and students enjoy reflecting on life long ago. This example shows a beach inspector in America measuring the exact length of a swimming costume. It had to be no more than 6 inches away from the knee. Imagine if they still had to measure this today! There are so many different ways to create a graph. You want to communicate your key point as clearly as possible. 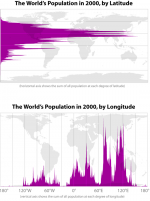 These 2 graphs created by Bill Rankin from Yale University in 2008 show how our world population looked in 2000 when sorted by latitude into north and south hemispheres. The graph shows that about 88% of us live in the northern hemisphere. On average the world’s population lives 24 degrees from the equator. When sorted by longitude it shows that most people live up to 180 degrees east of Greenwich. What are some different ways you create graphs in your classroom? 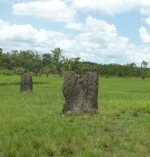 The huge magnetic termite mounds at Litchfield National Park, Northern Territory, are perfectly aligned north to south to minimise the exposure to sun. This brilliant architectural feat keeps the mound at exactly 30 degrees C. They include arches, tunnels, chimneys, insulation and nurseries. Challenge your students to discover other creatures that use NSEW orientations in their daily lives. 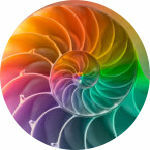 How do the 4 major compass points effect your life? Ann and John Betar are currently the longest married couple in the US. They were married on 25 November 1932. That’s 81 years. The record for the longest married couple is Karam and Katari Cham in Bradford, UK. They were married for almost 88 years. Your students can create a table recording their grandparents’ marriage records. When was the earliest marriage for grandparents? When was the most recent marriage? What are some questions they can ask? What can they discover by looking at the data in this table? 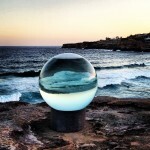 Every year for the last 17 years, Bondi has hosted Sculpture by the Sea in October /November. It began as just one day and now lasts over 2 weeks. It is a fantastic opportunity, if you can get to Sydney, for your students to view and discuss their reactions to over 100 sculptures. The sculpture shown here is Horizon by Lucy Humphrey. If you are not able to get to Sydney for this event, there are plenty of photographs online. You can also see the exhibition at other times of the year at Cottesloe, Western Australia and also Aarhus, Denmark. Remember that it is often more important for your students to be able to estimate effectively than to calculate accurately. Encourage them to find strategies to help them estimate each day. For example, one strategy might be to visualise breaking up a large quantity into tenths. Roughly work out how many in that tenth and then multiply by 10 to get your estimate. How many bananas do you think are in this pile? How does your estimate compare with a friend’s estimate? Is it in the right ballpark? How do you know? 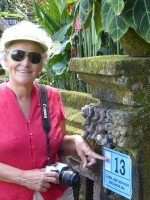 Keep on the look-out for fantastic photographs showing larger than normal occurrences of numbers in real-life. These will make your maths so much more meaningful … and memorable … for your students. For example, I think this is definitely what you would call “an overcrowded train”. How many people do you think might be travelling on it? What strategy will you use to make your estimate? This activity is useful for almost any age group. Ask everyone to individually go to this website, put in their birth details on the left, press “Today” on the right and presto, you have it! You can then ask everyone to sort the days into place value order. And what about sorting your weeks with your younger students or hours, minutes and seconds with your older students? At last, proof that I am not the only maths mad person around. Just discovered this lovely blog by photographer Roger Dean, who has photographed house and street numbers around London. His plan is to photograph each of the numbers to 365, one for every day of the year. Delightful. Finding suitable money photos to help you and your students create your own real-life maths activities is easy. Out shopping, driving along in the country, in a supermarket., having breakfast in a cafe. And we are regularly adding more, like the 19 new photos from a recent visit to beautiful Morpeth, just outside of Maitland in the Hunter Region. Once you subscribe you can easily download the photos you need. Challenge your students to create their own activities, relevant to your focus for this week. For example, these Lime Rock boiled lolly jars cost $5.50 each. The 40 lollies in each jar have a total mass of 110 g, so what’s the average mass? How much do you pay for just one lolly? How much will all 5 jars cost? If I want to put 5 pieces in a party bag for my birthday guests, how many jars do I need to buy if I am expecting 20 people? What shape is each jar? Why would it be this shape? How much glass would be needed? Why select glass and not a cardboard box? If you design a box to hold 40 lolly pieces, what shape would you make it? Why? If these jars come in a large cardboard box that holds 60 jars, is it too heavy for you to carry safely? What else can you invent with your students? Use each illustration in our Maths Graphics to create your own story problem, poster, worksheet or activity card. Make multiple clones for adding, subtracting, multiplying and dividing. The only limit is your imagination and the needs and interests of your students. This is an example of a Counting Poster using a one of our People Maths Graphics. Each day you can select a different number to count. 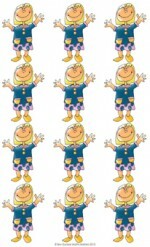 For 5 year olds, tell the story of how much pocket money this girl gets each week. Count her money in multiples of $2 or $5 or $10. For older students, today’s story may be about packing fruit into boxes. Every day she packs 25 boxes so count in multiples of 25. Every day a different counting story. Every day a different counting multiple. What story will you create today with your students? You can access these documents directly by clicking here. Where do the names come from? What is the origin of our days of the week? The moon travels around the earth in 7 day cycles as a new moon, half moon, three quarters moon and full moon. Most cultures in the world name a 7 day cycle. Our Sunday of course is named after the Sun. Then comes the Moon for Monday ( Moon Day). Tuesday is derived from Tyr’s Day. Tyr was the god of single combat in old Norse mythology. Wodin (or Odin) was the greatest Scandinavian God, the ruler of Asgard. Wodin’s Day became Wednesday in English. Thursday gets its name from Thor, the ancient Scandinavian god of thunder. Thor’s Day became Thursday in English. 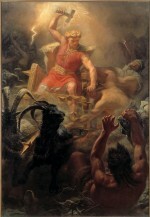 Thor was the son of Wodin.You can see Thor, the god of thunder, with his hammer in this painting. Friday gets its name from Wodin’s wife Frigg, so Frigg’s Day became our Friday. And Saturday comes from Saturn’s Day, named by the Romans who believed the planet Saturn controlled the first hour of that day. How do other cultures name their days? This will be a great Measurement activity for your students. We live at house number 13 too. It is a 2-digit number, larger than 10, smaller than 20, in between 9 and 15. One is in the 10s place and 3 is in the 1s place. It’s an odd number because the last digit is odd. The last 2 digits of my phone number are 1 and 3. My brother is 1 year older than that. The two digits add to 4. If you add 10 it makes 23, if you remove 1 it is 12, if you add 1 it makes 14. Double it is 26. Take it away from 100 leaves 87. Multiply it by 10 makes 130, by 100 makes 1300, by 1000 makes 13000. I can buy a chicken salad lunch for $13. If I share it between 3 people each person gets $4.33. It’s a quarter of 52 so I would need 4 x $13 to buy my school uniform which costs $52. You’d need 3 cars to take 13 people to a party including the drivers. That’s the total number of sides on a hexagon and an octagon. It’s 13 kilometres to our nearest cinema. I can toss a beanbag 13 metres. There are 13 letters in my first and last name. In other words, you want your students to creatively expand their thinking without the need for any restrictions. The sky is the limit. You could challenge your class by asking every student to say something different each time, all based on the starting point of 13. Encourage a mix of number facts as well as real-life links. We need them to see the relevance in as many places as possible. Coincidentally there are 13 letters in the word “brainstorming”. Spot check your Low Block Foundation/Year 1 (Early Stage 1 or Stage 1) students for their ability to conserve number, In readiness for a focus on simple adding and subtracting. These students should already be able to 1-1 match oral number words to objects accurately. To conserve number means that a young student understands a quantity does not change if it is rearranged, covered up or hidden behind a box. A student who can conserve number is ready for the concept of addition where you can count on to find the total of 2 groups. A student who can conserve number can also count back to find the difference between 2 quantities. A young student who cannot conserve number doesn’t understand that a quantity remains the same when it is rearranged. This student is able to 1-1 match number words to objects but continues to recount when objects are rearranged. These students solve addition problems by counting all objects one by one. This is a Count All strategy, which is NOT an addition strategy. You can’t expect these students to participate effectively in any addition or subtraction classroom experiences. You need to identify these students before you focus on any addition or subtraction experiences. Ask the student to count out 8 objects for you and to place them on the table. Next tell the student that you are going to put these “frogs” together in pairs e.g. rearrange the 8 objects into 2 lines of 4. After the objects are rearranged, ask the student; “How many frogs are there now?” Notice the student’s response. Some students will automatically say “8” so you can confidently mark their name off as a conserver on your checklist. Some students will look at you as if to say “…but I already told you that…” but they will still recount. You need to rearrange the objects a third time, e.g. in a curve. Again ask: “How many objects are there now?” If they are a conserver they will definitely tell you “8”. You can then mark them off on your checklist. But if a student recounts all the objects this third time, it is a strong indication that they cannot conserve number. These students are not indicating their readiness to experience adding 2 sets together. They need to experience counting objects, covering them up and then saying how many there are altogether. They need to “trust” objects. It may take some time focusing on similar activities to this before they realize that the number of objects does not change if they are rearranged or hidden. These students are definitely not ready to investigate adding and subtracting objects from a given group. When we talk about student ability levels, we often use terms such as low, medium and high ability. In itself a term like “low” conjures up images of students who do not have the capacity to learn as much as others. It implies that we as teachers have not much control over such a student’s learning, as if they are missing a “maths gene”. But what happens if a low ability student now understands that concept that was previously beyond their grasp. How do they go from being a low ability student in front of your very eyes to being a medium or high ability student, for that concept? I find a more useful maths language term is “blockage”. Again we can categorise our students as low, medium or high block, but the terms “high” and “low” are now opposite in meaning to our previous focus on “ability”. A new image reveals itself. If a student has a high blockage, it implies far more action on our part as teachers. There are multiple things that can be blocking this student, including emotional and physical as well as conceptual issues. How can we unblock this student? What strategies have we tried already? What other strategies may be effective? What language structures have I used? What terms does this student misunderstand? And if they are able to tackle a misunderstanding effectively and now “get” what it is we are talking about, they are unblocked. Their ability hasn’t magically jumped from low to medium or even high. The emphasis becomes on what we can do and provide as teachers to remove each student’s blockage. A medium block student has several misunderstandings and after some one-to-one questioning and discussion with you or fellow students they may discover their incorrect thinking. A low block student may have just one or two misunderstandings and can more quickly see how to change their thinking. It’s a little bit crazy, but I think of blockages as transparent clingwrap. Imagine your students are sitting in front of you with different layers of clingwrap covering their eyes. They can all see something, but those with only one or two sheets of the clingwrap, your low block students, can see most clearly and can see perfectly once those few sheets are removed. Everyone has the possibility of understanding more. It does not mean that your high block students WILL understand, but the language of blockages gives us more confidence that they are capable of learning. There is no maths gene that some students have and others don’t. What can we all do to help each student learn more effectively?